East of the posited course of Road 1 on the north side of the watercourse, there is considerable change in land-use (Figure 166). The cemetery ceases to be used by the end of Period 3 or perhaps the start of Period 4 (i.e. mid/later 2nd century) and the north bank is seemingly cleared and levelled for a second time. Ditches signal its subdivision during the 3rd century. One of these is substantial and timber-lined, perhaps constituting more of a channel than a ditch per se. A function as a mill leat or a drain from a high-status dwelling or bath-house is posited. The watercourse itself accumulates significant quantities of silts during Period 4, perhaps as a result of the imposition of the wood-lined channel, conjectured to divert the flow of water away from it. The presence of small pits and the base of a possible part-cellared building suggest a more general, occupation, use of this vicinity. Within the watercourse, a substantial sequence of water-laid deposits (12093, 12094, 12096, 12097, 12098, 12099, 12100, 12101, 12142, 12157, 12158, 12159, 12160, 12163, 12164, 12165, 12167 Group 970) was revealed in a largely machine-cut section trench. These were subject to very limited hand excavation because of severe water-logging. The deposits are essentially substantial grey clays separated by thin layers of sand. This sequence becomes more complex and intermixed at the centre of the channel and suggests a shift of the main current toward the south bank through the 3rd century. In addition, the clay deposits seem to contain sand in the lower part of the sequence but silt in the upper, perhaps indicating a slowing in the rate of water flow through the channel. While deposits 12101 and 12159 contain early 3rd century pottery, the majority of the sequence below them is essentially undated. It is difficult to speculate about the nature and extent of the Period 4 accumulation within the channel, though it is postulated that the channel was not particularly deep in its entirety and that the majority of its silting belongs to this period. This 3rd century accumulation appears to have filled the whole of the channel, as denoted by the dating of deposit 12093. Interestingly, none of the upper channel fills contains later pottery, suggesting there is no longer a hollow to fill in beyond this period. The nature of the seed remains recovered from three of these deposits (12101, 12135, 12142; see plant macrofossils report) also suggests that the channel is not active, or only intermittently so, while they are accumulating. Within this sequence, deposit 12101 is worthy of particular note. Over 16kg of tile was retrieved from this substantial yellow-grey sand and gravel deposit, together with pottery and tesserae. This building rubble content is also present, in significant but lesser quantity, in overlying layers 12094, 12096 and 12097, with 12094 featuring seventy-one tesserae. Most importantly, the deposition of this material in the watercourse is likely to be contemporary with that in the dumps along the north bank (see below). 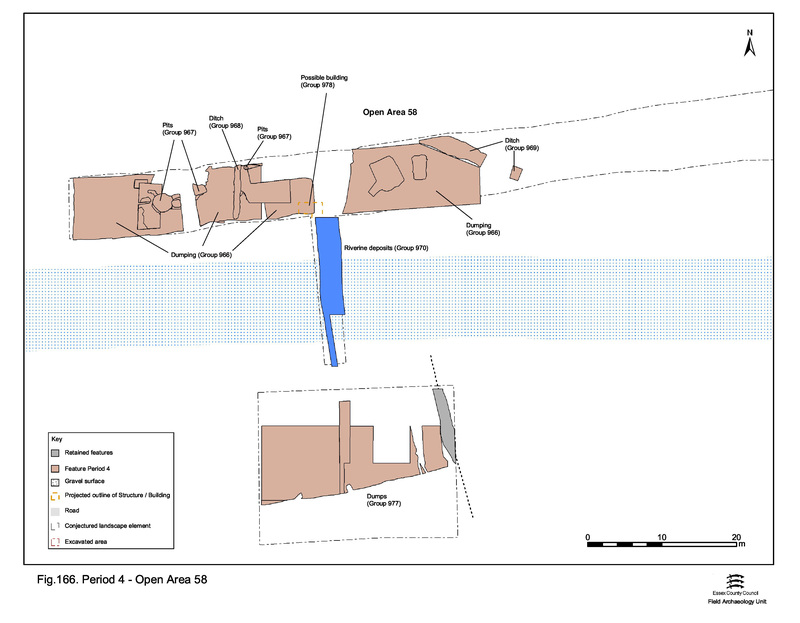 The cremation cemetery activity noted to occupy the reclaimed/consolidated north bank of the watercourse in Period 3 may extend into the mid/later 2nd century (Figure 166). Thereafter, significant change of use is evident. The burials are overlain by silty gravel dumps (12041, 12056, 12057, 12063, 12064, 12075, 12078, 12079, 12104, 12111, 12114, 12115, 12124, 12190, 12040, 12048, 12055, 12067, 12089, 12103, 12118 Group 966) of early 3rd century date. This dumping episode perhaps constitutes a second clearance and levelling of this location and certainly marks a change of use for the North Bank. All subsequent Period 4 features are cut into these deposits. These deposits contain substantial amounts of building rubble; mainly brick and tile, but also nails and window glass along with charcoal and burnt clay fragments throughout. Some of this dump material appears to have been deposited within large rectangular cut 12061/12371 (Group 978), tentatively interpreted as the site of a semi-basemented building. The dumps are similar to broadly contemporary deposit 308 on Drury's Crescent Road site (Wickenden 1986, 13-15). Additional brick and tile rubble is present in 3rd century contexts within the river channel (see above) and these are likely to be associated with this episode. Further widespread deposits of relatively clean gravelly silts overlie the rubble dumps and may be levelling layers associated with the reconstitution of the land surface in this vicinity. Again, this may be equivalent to gravels 303 encountered on the Crescent Road site (Wickenden 1986, 15). Shallow, north-south aligned, ditch 25270 (seg. 12027) runs across the north bank. Some 1m wide and a maximum of 0.28m deep, with a rounded terminal at its south end, it was exposed for a length of approximately 5.6m. 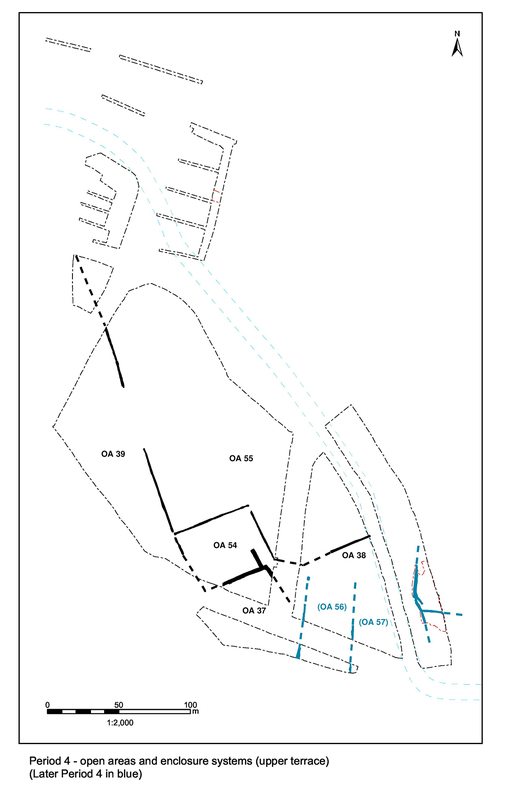 Interpreted as a minor boundary ditch, its alignment is at odds with all preceding linear features, seemingly indicating that a realignment of land divisions takes place following the abandonment of the cremation cemetery and subsequent reinstatement of the North Bank. The ditch terminates before reaching the watercourse, and is unlikely to function as a drain per se. Perhaps functioning principally as a boundary, it is notable that, apart from small pit 12022 (Group 967), all of the Period 4 pits are located to its west. Ditch 25270 is most likely established in the mid- to late 3rd century but continues to accumulate material as late as the 4th century AD. Its fills contain late 3rd century pottery, with Late Roman and Saxon material in the latest fill only. 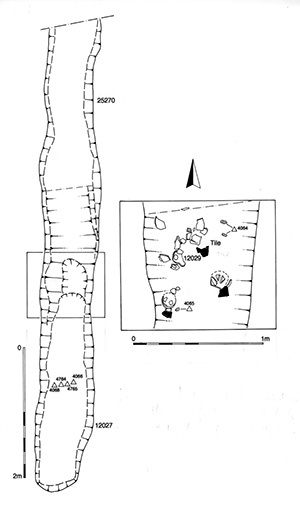 A possible structured deposit of complete vessels is located toward its terminal (Figure 175), along with large amounts of tile, iron objects (thirty-five iron objects; part of a box?) and some glass fragments. Some of this material shows signs of careful placement; at least one vessel is inverted and others apparently set on tile 'pedestals'. While this may seem superficially reminiscent of a disturbed or redeposited cremation, it is certainly much later than the cemetery. NW-SE aligned ditch 25271 (segs 12046, 12182), exposed for a distance of 11m, crosses the east end of the excavated area of the North Bank (Excavation Area R). 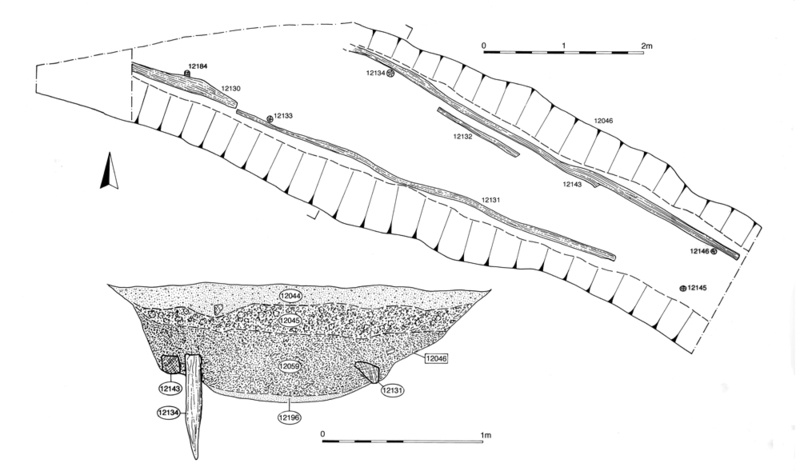 At a maximum of 2.35m wide and 0.75m deep, it is the most substantial ditch in this vicinity of any period (Figure 167). The remains of a wooden lining or revetment, consisting of split oak planks retained by vertical stakes, survive along either side of the ditch bottom. Although only a single course of this revetment survives, it is assumed that it originally extends the full height of the open ditch. The presence of such a lining within this major ditch signals its function as an active channel along which water flow is intensive. 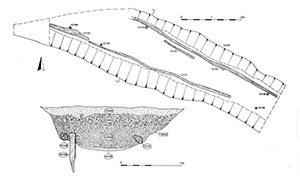 The downward slope of the ditch base indicates a south-eastward direction of flow, presumably into the adjacent watercourse. Projection of this channel, as a straight linear in either direction, would suggest that it is deliberately constructed to cut the corner of the watercourse. A function as a mill race/leat is possible, with a mill therefore located somewhere to the north-west under what is now Crescent Road. However, an alternative function as a water supply and/or drain to a substantial dwelling and/or bath-house is an equally valid interpretation. The revetting of this ditch appears to have prolonged its use. 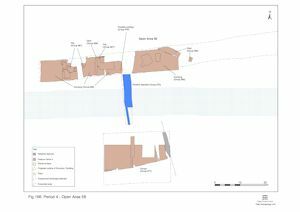 The timber lining has produced a dendrochronological date of AD 215-251 and a mid-3rd century construction date for the ditch is indeed likely. However, even the lower ditch fills yielded 4th century Roman pottery, plus some early Saxon. The abraded nature of the ceramic assemblage, and the deposition pattern of the flat silt-gravel fills themselves, argue for 25271 being a well-maintained water channel that was deliberately infilled as late as Period 6. 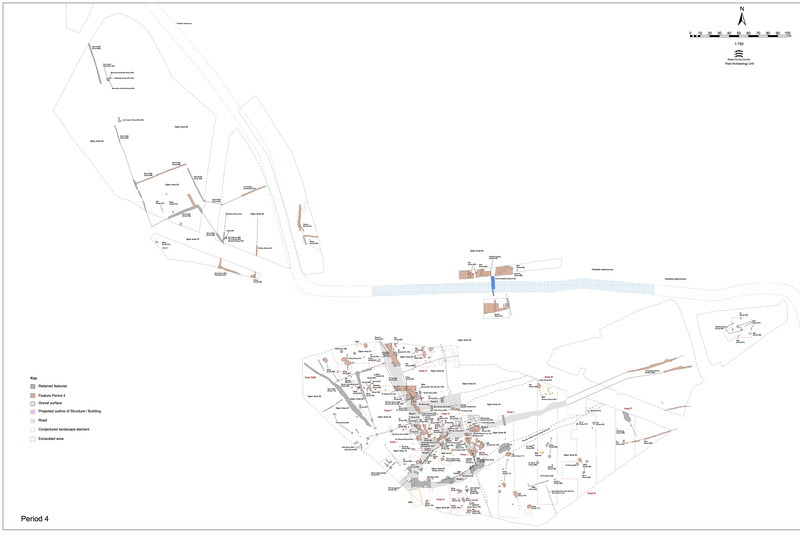 Cut into the 3rd century dumps and levelling deposits are a small number of pits (12020, 12025, 12034, 12022 Group 967). Most are round to sub-square and 1-2m wide; small cut 12022 may be a post-hole rather than a pit. 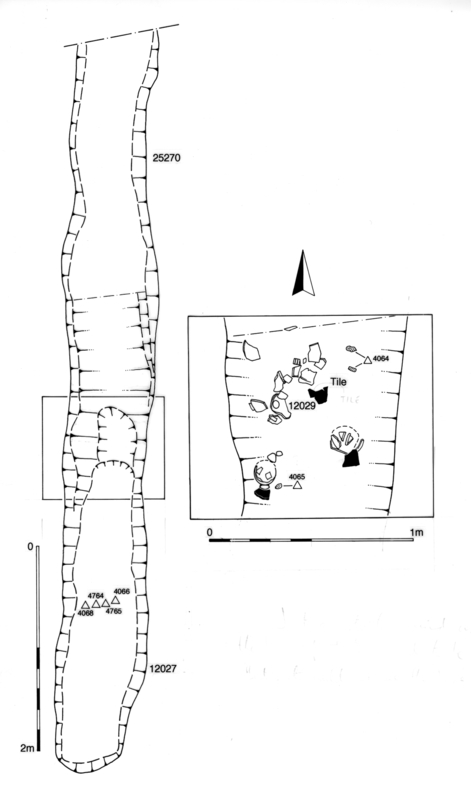 Lying close to the Period 3 cremation burials, pits 12020 and 12025, although separated from them by the Group 966 levelling dump, were thought at the time of excavation to be further burials. Both contain burnt bone and charcoal. However, unlike the confirmed cremation burials, no assemblages of grave goods are present. It is probable that any burnt bone content derived from the attested disturbance of the earlier burials. 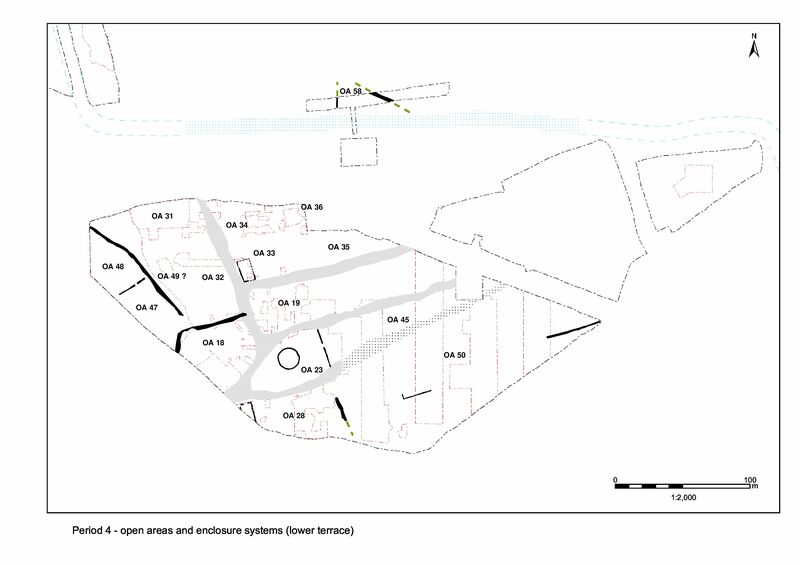 These pits generally contain large assemblages of pottery and tile in relation to feature size, as is also the case with 3rd century pits elsewhere across the settlement. Tile tessera and iron nails are also present, though the quantity of animal bone is conspicuously low. Twelve sherds of vessel glass (see 'The Roman Glass') from pit 12020 may, along with the burnt bone previously mentioned, be derived from a disturbed cremation burial. However, it is noteworthy that nine of the fragments are window glass. Pit 12034 additionally contains a glass bead (SF4766). Large rectangular cut 12061/12371 (Group 978), located just east of ditch 25270, is tentatively interpreted as the remains of a semi-cellared building cut into the Period 3 dump sequence. Measuring at least 8m north-south by 7m east-west, its flat base was encountered approximately 0.2m below the stripped surface of Excavation Area R.
Although recorded as being filled/overlain by the Period 4 north bank dumping (see above), its alignment on ditch 25270 might suggest that it should be later than them. Indeed, its recorded fills are not that similar to the dump deposits.